Manchester United managed an impressive 1-1 draw with reigning European Champions Bayern Munich at Old Trafford in the first leg of their Champions League quarter final. Bayern enjoyed the lion’s share of possession in the first half, with Manchester United looking threatening on the counter. 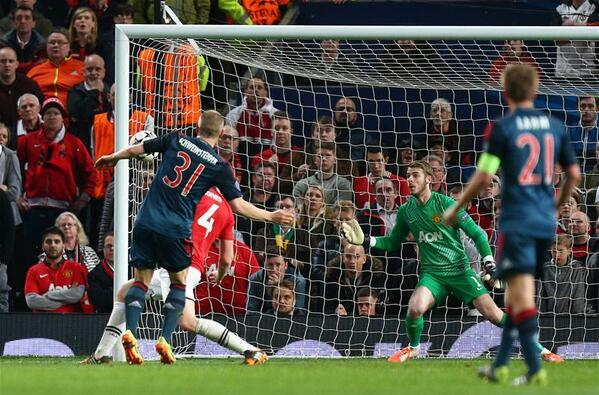 Although Bayern continued to keep pressure on the final third, they failed to keep goalkeeper David de Gea busy. Franck Ribery and Arjen Robben tried to engineer a few clever moves, with the latter forcing a magnificent sprawling save from De Gea as the half wore on. Somewhat surprisingly, the best chance of the first half fell to the home side. Wayne Rooney slid a perfect through-ball to Danny Welbeck, who tried to dink it over Manuel Neuer, but failed horribly in his audacious attempt. The visitors created an early opportunity in the second half, when Bastian Schweinsteiger found himself positioned inside the box, but the German’s effort went way over the bar. Manchester United manager David Moyes made a positive move in the second half by bringing on Shinji Kagawa, who made an instant impact. The Japanese international earned a corner after some good work in the flank, and from the resulting set piece, Nemanja Vidic gave Manchester United the lead with a guided header, after the skipper found himself unmarked in the box. But the lead lasted only minutes. The ever dangerous Robben started a dangerous move from the right side and played the ball into the path of the advancing Rafinha, who’s cross found its way to Schweinsteiger, who finished with great aplomb to give Bayern that all important away goal. The visitors pushed forward looking to kill United, and could well have done through Robben, who just missed the target with a low effort from inside the box. Bayern goalscorer Schweinsteiger was dismissed in the dying minutes for a lunge on Wayne Rooney, and he and Javi Martinez will miss the second leg through suspension. Although United are still very much in the tie following the 1-1 draw, will have to score in the Allianz Arena to be in with a chance of progressing to the semi-finals.